In 1985, Marcy Goldman created Matzoh Buttercrunch, a Passover confection that took the country by storm, and it remains the most popular holiday recipe. 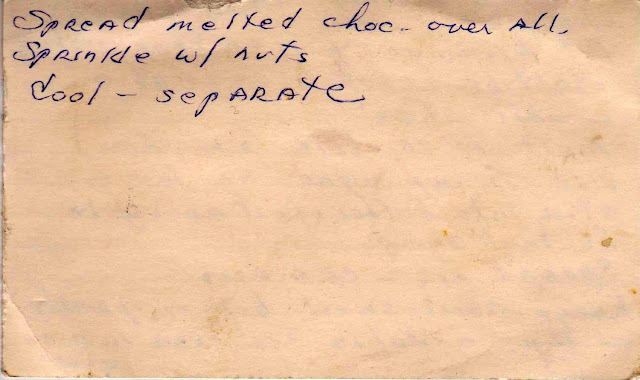 Marcy was inspired by a recipe much like this Chocolate Bark, though this recipe -- from the collection of Olive Facey -- is even simpler (and less caloric) than the modern day incarnation. But is just as easy and delicious. And infinitely more convenient, i.e., not everyone has matzoh year-round. 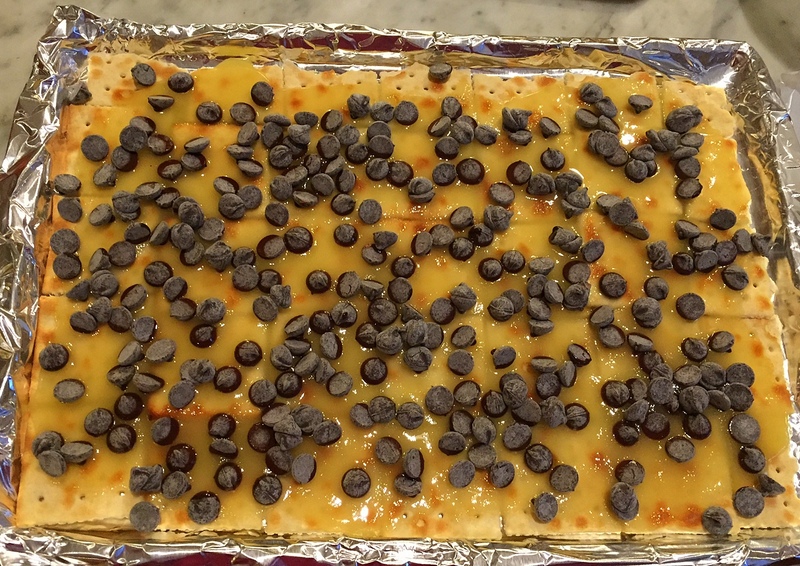 Chocolate Bark is simply a sugar-butter mixture poured over Saltine crackers, topped with chocolate and baked. Adding toasted nuts is optional. It takes just a few minutes to make. 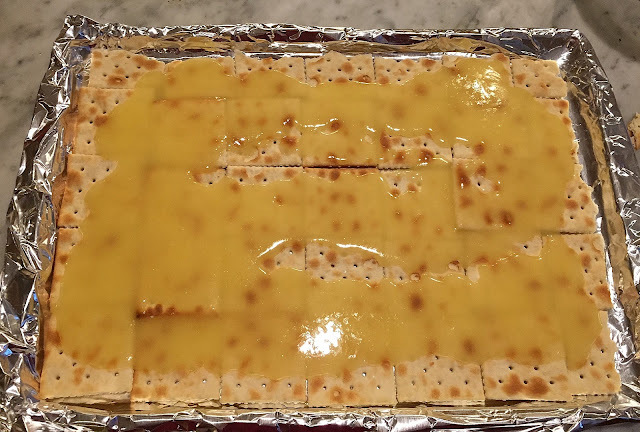 Marcy substituted matzoh for the Saltines, as they can't be eaten on Passover. But following Olive's card, I used old-fashioned saltines. To begin, line a cookie sheet with foil and then Saltines. You will probably need to break some to fill in all the spaces. 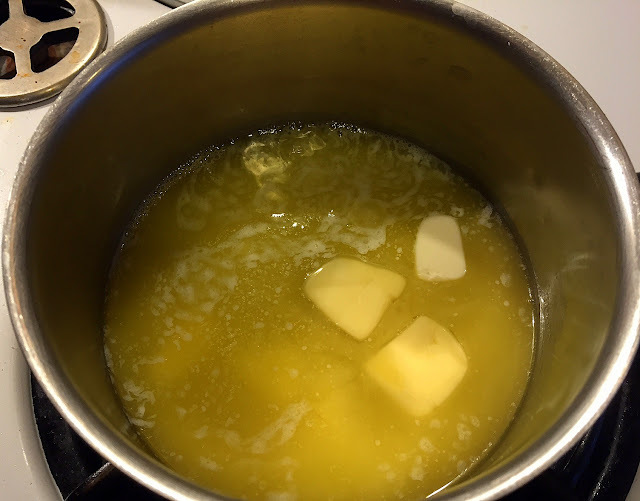 Next, melt a stick of butter over a low flame. 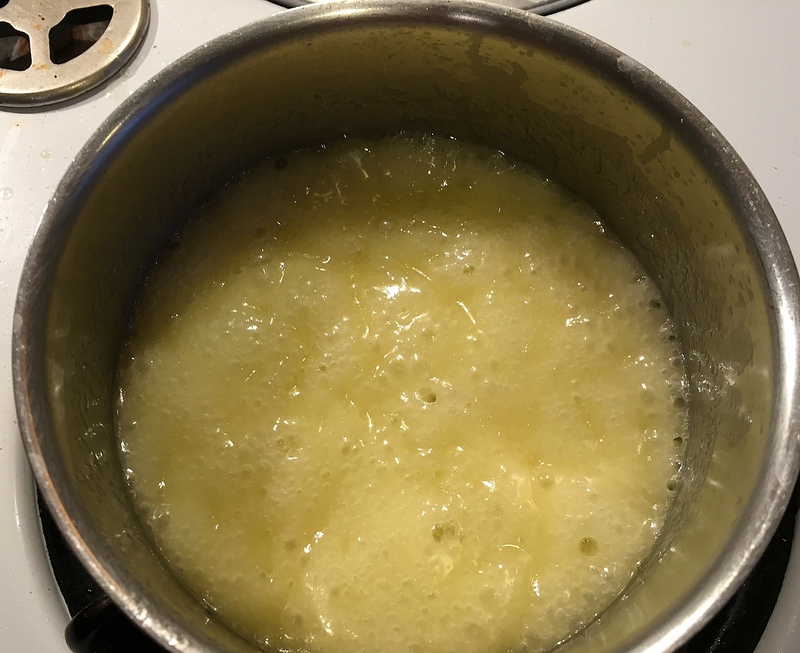 Add the sugar and cook until the sugar dissolves and it looks like this. 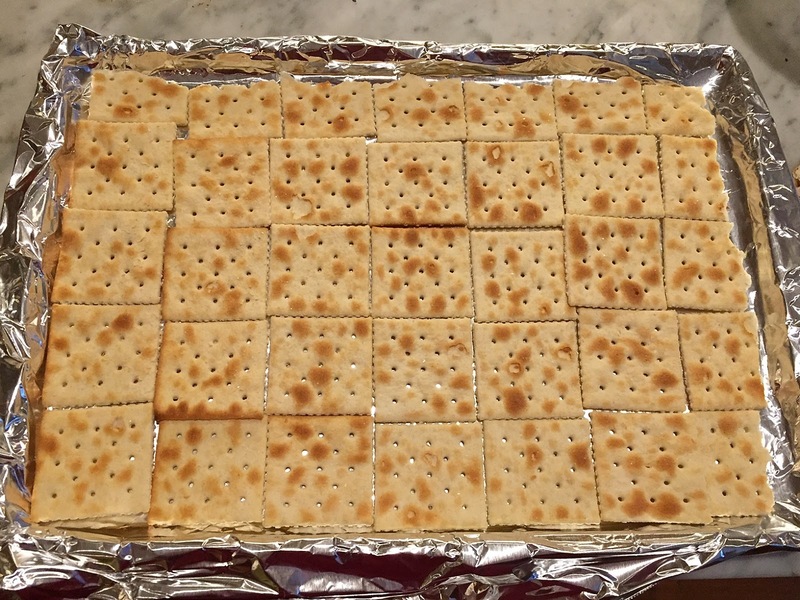 Pour it over the crackers covering them as best you can. Take the back of a spoon, knife or offset spatula to evenly spread, trying to cover every cracker. Sprinkle chocolate chips atop the mixture. The amount is up to you. 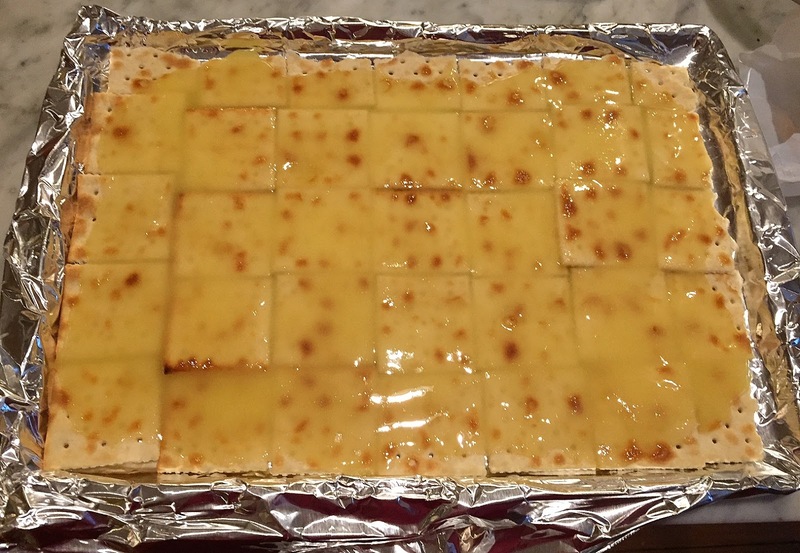 Place in a preheated 350F oven. 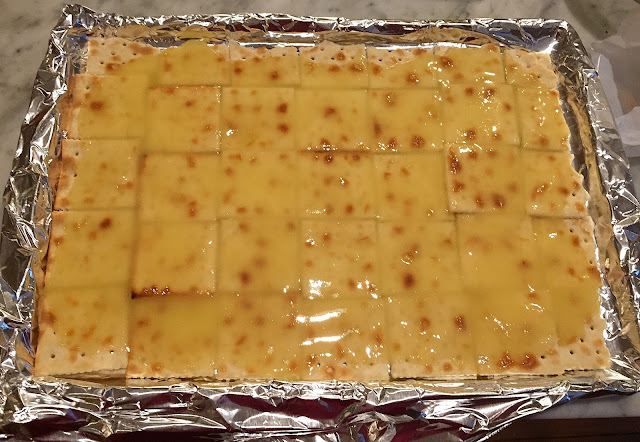 Bake for ten to 15 minutes. The chocolate chips won't be completely melted, so spread them with the same tool used to spread the sugar mixture. 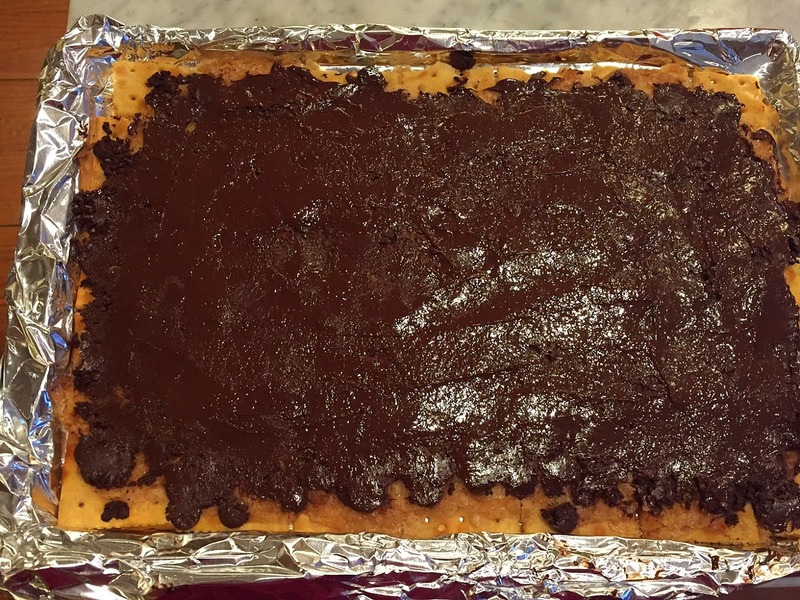 I even added more chocolate at this point, as I thought the layer was bit too thin. The chips will melt. Sprinkle the top with chopped nuts. I used pecans, which I toasted in the oven while the bark was baking. Refrigerate until cold, then break up the pieces with your hands. 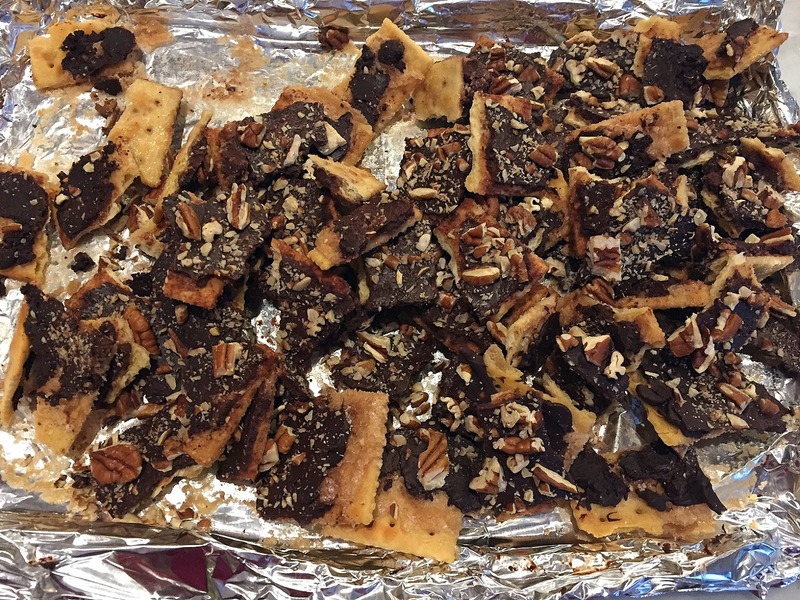 Unscientific observational differences between Chocolate Bark and Matzoh Buttercrunch: The buttercrunch has a much firmer base, as matzoh is not as soft as Saltines, but the salted crackers added a nice flavor note. 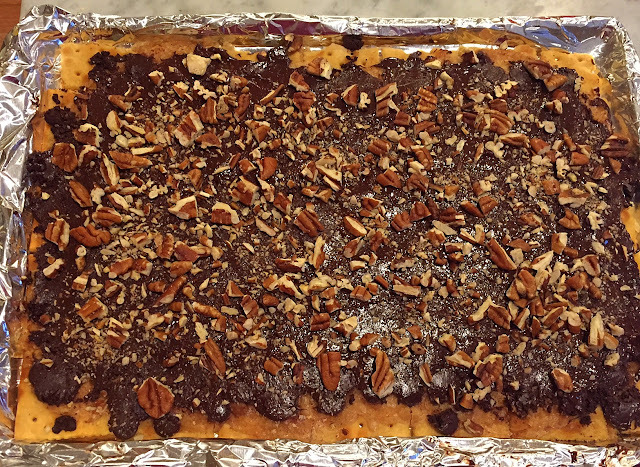 Buttercrunch uses brown sugar, which adds a depth of flavor lacking in white sugar (but if you cook the mixture longer, that issue would be mitigated, as it would become more caramel-y), and it also uses double the butter, making it more caloric. 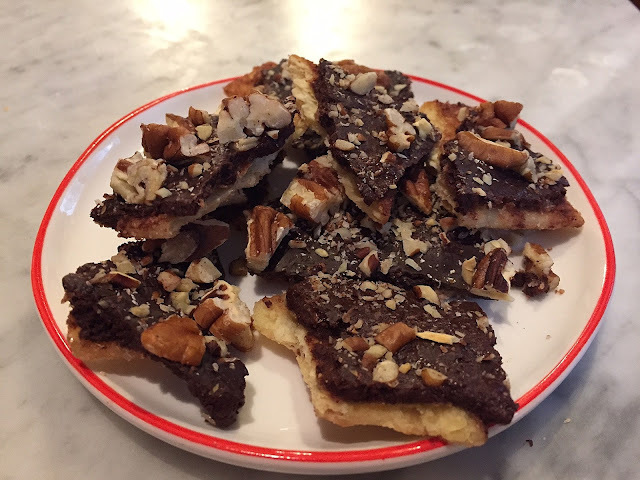 Having said all that, upon sampling the bark this morning, the DH declared: This tastes exactly like matzoh buttercrunch! Below is Olive's recipe card -- part of her collection generously given to me by her handsome son Stephen. It appears to have been shared with her by Lorraine Allison. 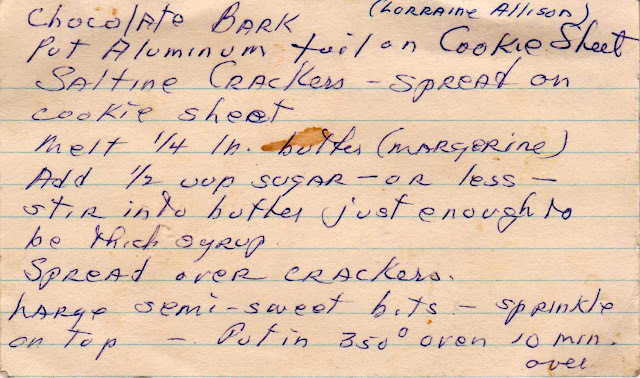 Production notes: I followed this almost exactly, but I cooked the butter sugar mixture (which is not indicated on the card). I used a 9 x 13 inch cookie sheet, and about 3/4 cups of chocolate chips. I baked it for 15 minutes.